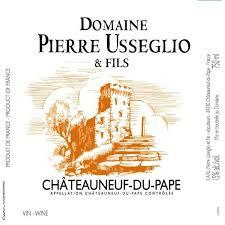 2016 Pierre Usseglio Chateauneuf du Pape - $34.99: Vins Rare, The finest selection of rare wines. Jeb Dunnuck 93 Don't Miss! Brilliant ruby-red. A highly perfumed bouquet evokes ripe red berries, garrigue and potpourri, along with subtle woodsmoke and white pepper notes. Sweet, seamless and focused on the palate, offering juicy raspberry liqueur, spicecake and allspice flavors firmed by a spine of juicy acidity. Delivers a solid flavor punch but comes off graceful; a suave candied lavender note drives the gently tannic finish.